The GDPR is new and your organisation will need to develop its own interpretation as to how it applies to your business. Dynamics NAV can be an important part of your journey toward GDPR Compliance. The purpose of this document is to provide you with some basic understanding of the GDPR and relate that to Dynamics NAV DSGVO. While compliance with the GDPR is mandatory in the specific situations outlines below, this document is not a "Check box" exercise. Rather, the content is intended to help you enhance your overall data protection and privacy capabilities. Seite 7 von 13: The March 2018 cumulative updates, for the Microsoft-located and W1 versions of Dynamics NAV 2015, Dynamics NAV 2016, Dynamics NAV 2017, and Dynamics NAV 2018, are the first to add new tools that can help you fulfill your GDPR obligations. Gerne schicken wir Ihnen das Original Microsoft Whitepaper "Supporting your EU GDPR Compliance Journey with Dynamics NAV" per Mail zu. 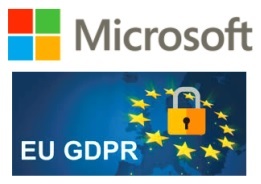 This white paper is a commentary on the GDPR, as Microsoft interprets it, as of the date of publication. We’ve spent a lot of time with GDPR and like to think we’ve been thoughtful about its intent and meaning. But the application of GDPR is highly fact-specific, and not all aspects and interpretations of GDPR are well-settled.